Pioneers in the industry, we offer powder paint shop, powder coating machine, conveyorised paint shop and pre treatment plant from India. 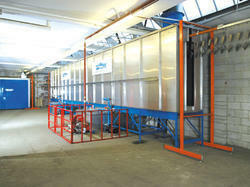 Shivaco offers a wide range of Powder Coating Plants and accessories, Shivaco offers Conveyorized and Batch Type Plants. The Conveyorized Plants are recommended where production volume is high and Batch Type Plants are provided for small qty of production volumes. 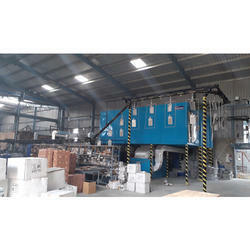 The Powder Coating Booths are provided with Automatic and Manual type of Coating, with high end powder recovery systems like Single Cyclone Recovery, Multi Cyclone Recovery and Cartridge Type Recovery System. 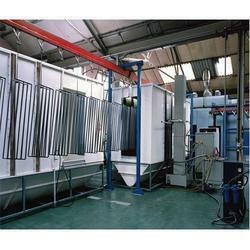 We are instrumental in offering Powder Coating Plant, that is highly demanded in the market. These plants offered by us assist in painting solids in an environmentally friendly method. The powder coating applied by these plants adheres to the product easily due to the to an electrostatic charge applied to the powder during coating. 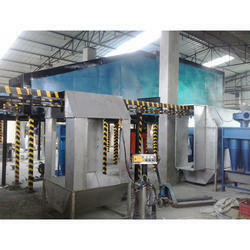 We are serving this industry for long for high quality conveyorise powder coating plant. Our Pre-treatment is a process in which the surface of the component to be painted is chemically cleaned and prepared for the painting operation. Metallic components, when they come for painting, are often contaminated by grease, oil, dirt, rust, and scales. Direct painting of such components without removing these impurities from the surface will result in not only an inferior finish, to begin with, but will cause deterioration of the painted surface, as rusting in between the metal and the paint skin spreads rapidly over large areas.Metallic components can be freed from impurities with proper pre-treatment, using degreasing and derusting solutions, coated with a protective layer of phosphates and passivated for lasting effects. 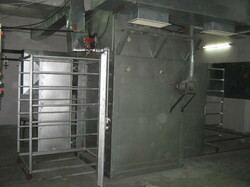 Uma Shankar Engineers (Brand Shivaco) offers Conveyorized Powder Coating lines consists of overhead Chain Conveyor passes through booth, coating is done with Manual / Auto Spray Guns and then enters thru the oven for baking process, the oven can be straight tunnel type or with loops inside it. Conveyor speed is worked out based on production rate required.